Within the person Markéta Nováková can be found the connection between Czech and Slovak pottery; she is a graduate of studio pottery and porcelain from the Faculty of Art and Design, University of Jan Evangelista in Ústi nad Labem and an absolvent of studio ceramics at the Academy of Fine Arts in Bratislava. 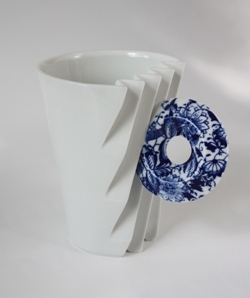 Her artwork is characterized by work with porcelain and its accurate, precise workmanship and purity of design. It is based mainly on geometry, from simple to complex geometric shapes, whose composition is revived with various decorative touches. Though she gladly reaches for traditional patterns, she does not exclude herself from experimentation with decor and plastic structures. Her way of working is telling of perfect mastery of materials and techniques. She participate in various exhibits, competitions, and symposiums in the Czech Republic, Slovakia, and abroad.